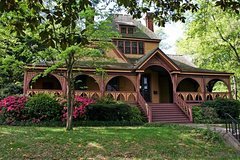 Tour the home of Joel Chandler Harris, the Atlanta journalist who penned the 'Brer Rabbit' stories. Harris first heard these stories while working on a southern plantation.Today, Atlanta’s oldest house museum preserves African American folklore. The home is restored to look just as it did when the Harris family lived here at the turn-of-the-century and the guided tours are steeped in Atlanta and regional history, 19th century architecture and interiors, as well as little-known facts about Harris’ contemporaries and friends: President Theodore Roosevelt, Andrew Carnegie, Henry Grady and Mark Twain. After your arrival at Wren's Nest, you'll meet your guide and begin your tour. Your guide will introduce you to the legendary turn-of-the-century author, Joel Chandler Harris. You will then follow your guide on a 45-minute tour of Harris' home. As you tour the home you'll learn how Joel Chandler Harris first heard the story of Brer Rabbit while working on a southern plantation and how Atlanta’s oldest house museum now preserves African American folklore or yesteryear. If you are visiting on a Saturday, make sure to plan your visit for 1pm, when on site storytellers share the Brer Rabbit stories -- a great addition to any tour for any age! Feel free to pack a lunch. The Wren's Nest was once a 19th century working farm and you are welcome to stay and enjoy a picnic on the 2.5-acre property in the heart of Metro-Atlanta.